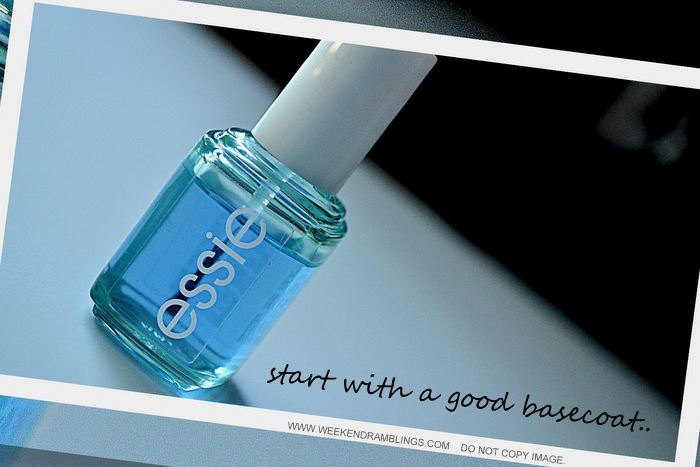 Always start with a base coat. A clear, protective base coat forms a barrier between the nail and your actual nail polish thus lessening the chances of any yellowing. It also smooths out the nail and gives a more even surface for the nail polish, thus giving a glossier finish. My pick - Essie All In One Base Coat. Avoid dark colors :D That should sort out the yellowing problem! Oh well, okay, at least try to avoid darker nail colors until your nails grow out to a healthier color. Opt for a trendy greige and make it your new fashion statement. On my nails this week - I decided to go with a wash of Chanel June. Avoid harsh nail polish removers. The reason this might contribute to the problem of yellowing nails is because, harsh nail polish removers literally strip out the nail and can make it more susceptible to any future staining. Use gentler nail polish removers and change the cotton often rather than using one polish-soaked pad for all the nails. I do keep a some acetone-containing stronger remover, though, to use for quick cleanup around the edges. Take a break - from nail polish. My nails are free of nail polish most days of the week, and it's only when weekend comes around that I actually bother with picking a shade. I stay at home, and I can be as laid back with my appearance as I wish, but others who step out into the outside world every day might want to do things differently. If possible, though, try to avoid nail colors for a while until the yellow nails grow out. Remedies to try at home for yellow nails: Disclaimer - I have never tried any of these, but I found a lot DIY solutions online, so am listing some here. Dissolve a denture-cleaning tablet in some water and soak your nails in this for a few minutes. Mix the juice one lemon in a bowl of lukewarm water and use as a once-weekly soaking treatment. A mix of olive oil and lemon juice applied to the nails helps with strengthening nails and grow them out healthier. Finally, while not really directly related to yellowing, try to use 3-free nail polishes (free of formaldehyde, toluene, and DBP) whenever possible, and always use a good cuticle/hand cream to keep your nails and hands looking healthy and soft. Aside from making nails look dreadful, staining due to nail polishes is not that much of a problem, and left alone, the nails do eventually grow out to a normal color. Yellowing of nails can also be due to much more serious medical issues, though, like jaundice or a fungal infection. Please check with your physician to rule out any medical causes. and if I count here ... then it is almost one full week of night shift haan ?? but I can relate to this .. why spend on 10 nail paints.... better buy one and stay happy :D when will i get to see a CHANEL Nail Paint on my bed side table ??? NARS delayed the package way too much..I returned it without even opening...don't think I will buy from the site at least ever again.